Sometimes the best animations go under the radar but are fantastic. 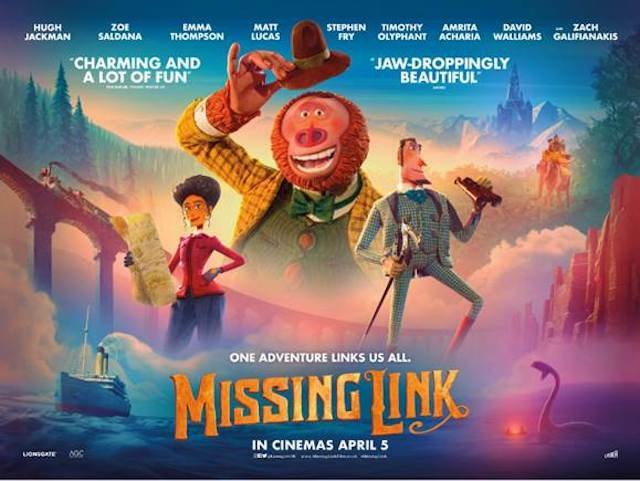 Overshadowed by a lot of kids’ movies out there at the moment, comes globe-trotting comedy-adventure Missing Link featuring stunning craftwork from the award-winning animation LAIKA Studios and vocal recordings by Hugh Jackman, Zach Galifianakis and Zoe Saldana to name a few. Read why London Mums and the kids’ club loved it. Don’t miss it when it comes out in cinemas on 5th April 2019. Missing Link is the best animation of the year so far, no doubt! Both mums and kids laughed from beginning to end. Missing Link is smart, quirky and hilarious at the same time. The perfect family movie for the Easter school holidays. Hugh Jackman’s Lionel Frost is an eccentric and humorous Victorian gentleman who goes to great lengths to be accepted in the order of the well-established explorers’ society. That creates all sorts of adventures and gags along the way. Mr Link is a naive Jeti-type of primal creature who managed to survive eras without ageing much but he wants come company now and looks for Jeti-like companions. Mr Frost helps him out hoping to have found his way into the explorers’ elite. Mr Link’s literal understanding of the English language creates amusing verbal miscommunication and super funny situations. The animation is stunning with vibrant colours and does not have over-exaggerated special effects. Don’t miss it until it’s in cinemas. This entry was posted on Wednesday, April 3rd, 2019 at 12:15 am and is filed under Movies. You can follow any responses to this entry through the RSS 2.0 feed. Both comments and pings are currently closed.